Current brain science shows that a lack of consistent emotional nurturance in infancy and childhood, when the brain is being formed, can result in difficulties with self-regulation, causing us to seek comfort and nurturance outside ourselves, often in substances, such as food, and behaviors, such as overeating. The good news is that our history is not our destiny, and the brain can be rewired. 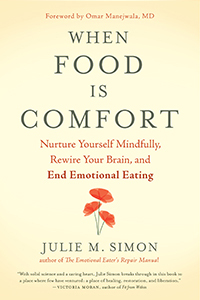 In When Food Is Comfort: Nurture Yourself Mindfully, Rewire Your Brain, and End Emotional Eating, author Julie M. Simon explains that, instead of turning to food for comfort, emotional overeaters can learn to self-nurture through the simple, easy-to-master skills she offers. We hope you’ll enjoy this excerpt from the book. If you regularly eat when you aren’t hungry, choose unhealthy comfort foods, or eat beyond fullness, then author Julie M. Simon’s new book, When Food Is Comfort: Nurture Yourself Mindfully, Rewire Your Brain, and End Emotional Eating, could really help. 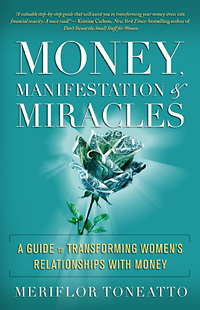 It includes her breakthrough mindfulness practice called Inner Nurturing, a step-by-step program that offers the practical skills you need to nurture yourself with the loving-kindness you crave. In this episode of the New World Now podcast, host Kim Corbin goes in-depth with Julie about how to provide your own Inner Nurturing and end emotional eating for good. 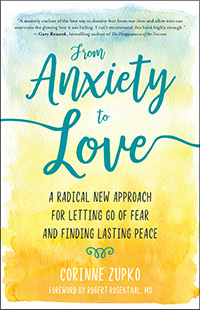 As Corinne healed her own mental anguish, she compiled the perception-shifting process she describes in her new book, From Anxiety to Love: A Radical New Approach for Letting Go of Fear and Finding Lasting Peace.